Where does the "Sandberg Game" rank on your list of Wrigley moments? 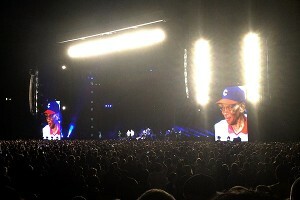 Cubs legend Ernie Banks joined Pearl Jam and lead singer Eddie Vedder -- a diehard Cubs fan -- on stage to sing "All The Way," Vedder's tribute to his favorite team during the band's rain-soaked concert at Wrigley Field. 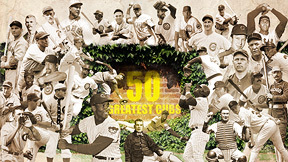 • Editor's note: What follows is ESPNChicago.com's ranking of the 100 Most Memorable Moments in Wrigley Field History. You can rank your own top 20 HERE. The Norge Ski Club's ski jump tournament was held over two weekends in 1944. Skiers took off from a scaffold ski jump covered in ice and snow and skiers and landed behind second base. 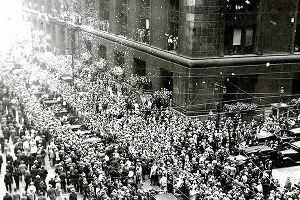 A fan's letter, according to the Chicago Tribune, wound its way around City Hall reporting "a chunk of concrete about the size of a small brick" landed on the foot of an elderly woman at Wrigley and warned that something be done before people were killed. 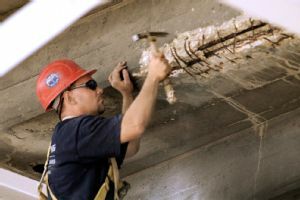 Over the next month, two more reports of falling concrete into the stands followed and protective netting was eventually installed. The Cubs retired Billy Williams' No. 26 in the same year he was elected to the Baseball Hall of Fame. 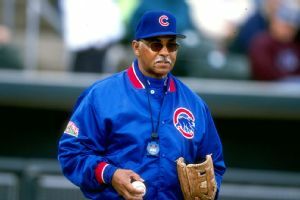 Williams, who spent 16 years of his 18-year career with the Cubs, was a six-time All-Star. 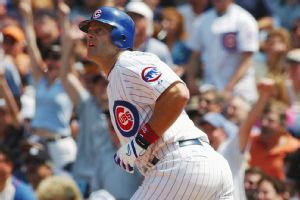 Eric Karros hit a three-run home run and Kerry Wood outdueled Roger Clemens to deny the Yankees great his 300th career victory. 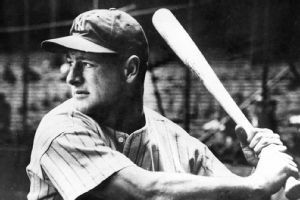 In a game between top New York and Chicago high schools, Lou Gehrig hit a ninth-inning grand slam to lead Commerce High School of New York past Lane Tech 12-8. The All-American Girls Professional Baseball League, made famous in the movie "A League of Their Own," held its first All-Star Game at Wrigley Field. The game was played under temporary lights. 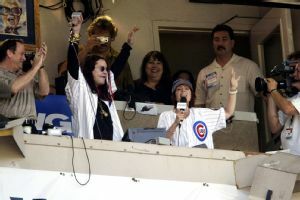 Continuing in a long line of celebrity guest conductors who don't know much about baseball, Ozzy Osbourne led Wrigley on an indistinguishable version of "Take Me Out To The Ballgame." The Chicago Sting of the North American Soccer League defeated the New York Cosmos 6-5 in front of 30,501 fans. In a rough season for the Cubs, the Sting outdrew every Cubs game except their home opener. 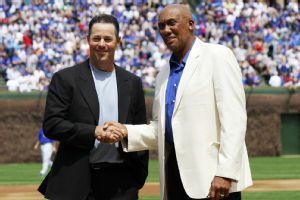 Hall of Famers Ferguson Jenkins and Greg Maddux played in Cubs uniforms 20 years apart but were honored together in a 20-minute pregame ceremony retiring their No. 31, the fifth number to be retired by the club. Aramis Ramirez hit a game-winning homer to beat the Brewers, helping them make a playoff push and edge Milwaukee for the division crown. The Cubs extended their winning streak to seven games with Ramirez's two-run, two-out line-drive homer in the ninth to lift them to a 6-5 victory over the first-place Brewers. Trailing the Braves two games to none in the National League Division Series, the Cubs sent 20-year-old Kerry Wood, who missed September with an elbow injury, to the mound in his playoff debut against future Hall of Famer Greg Maddux. Wood gave up just one run in five innings, but the Cubs couldn't solve Maddux, who pitched the Braves to a 6-2 series-clinching victory. 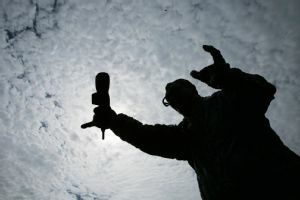 Selling 78,000 tickets in advance of the concert, Jimmy Buffett packed in the parrot-heads for the first rock concert at the venerable park, the musician's idea seven years prior. 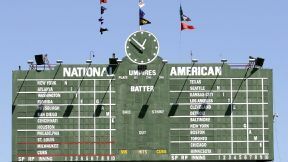 No one has hit Wrigley Field's famous manual scoreboard in center field with a batted ball. 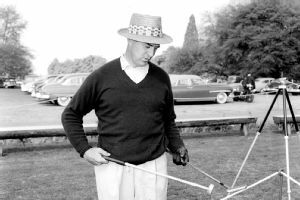 But Sam Snead, perhaps the greatest golfer in the world at the time, teed up a golf ball and cleared the scoreboard before a game against the Reds. 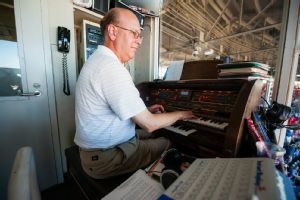 The Cubs were the first team to have an organ play inside their ballpark. The Harlem Globetrotters defeated George Mikan's U.S. All-Stars 57-51 in a game played under portable lights. 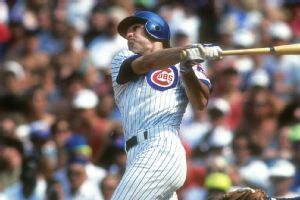 With Wrigley Field hosting the 61st All-Star Game, Ryne Sandberg led the National League to a victory over the AL in the Home Run Derby with three homers. Sandberg was crowned the champion even though the derby at the time was considered a team competition. 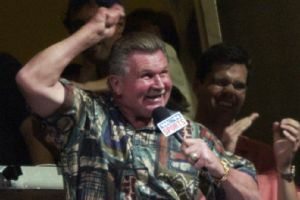 A tardy Mike Ditka kept the fans waiting -- and almost forced Steve Stone and Chip Caray to fill in for him -- only to hustle his way into the broadcast booth to lead Wrigley in the singing of "Take Me Out to the Ball Game" during the seventh-inning stretch. An out-of-breath Ditka turned in what might have been the fastest rendition in history. Two months after his death, the Cubs dedicated a Harry Caray statue at the corner of Clark and Sheffield. The statue was relocated to the bleacher entrance at Waveland and Sheffield on Sept. 1, 2010. The Cubs lost 11-3 to the San Francisco Giants in Game 1 of the National League Championship Series, the first postseason night game at Wrigley. 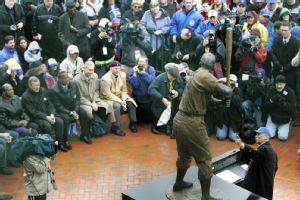 With the inscription "Let's play two," Ernie Banks' most famous catchphrase, Mr. Cub's statue was unveiled near the main entrance of the park at the intersection of Sheffield and Addison. 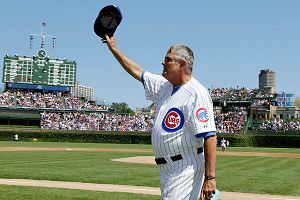 Cubs manager Lou Piniella surprised many when he announced that day's game would be his last. Citing the need to step away to care for his ailing mother in Florida, Piniella got emotional during the game and talking about his decision after, closing the book on a 41-year baseball career, including 23 as a manager. Mike Quade took over as interim manager for the final 38 games of the 2010 season. Don Cardwell, who was acquired in a trade with the Philadelphia Phillies two days before, tossed a no-hitter against the Cardinals. 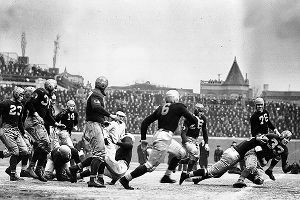 Sammy Baugh led the Washington Redskins past the Chicago Bears 28-21 in the 1937 NFL championship game with 14 fourth-quarter points before a crowd of 15,878 at Wrigley. Wrigley Field has held more than baseball games. 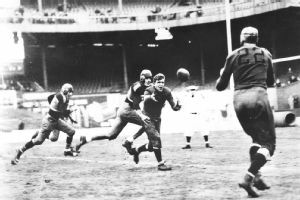 In the first professional football game at what was then named Cubs Park, the Chicago Tigers hosted the Racine Cardinals in a 0-0 draw in front of a crowd of 8,000. The American League beat the National League 2-0 in a rain-soaked All-Star Game. Cubs Ryne Sandberg and Andre Dawson were in the NL starting lineup, but Mother Nature proved to be a rude host with rain delaying the game in the seventh inning and chasing away many of the 39,071 in attendance. The Cubs were eliminated from the NLDS with their third straight loss to the Arizona Diamondbacks. 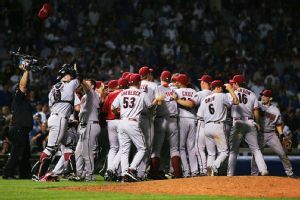 Chris Young homered on the game's first pitch off Arizona's Livan Hernandez, but before it was over, three different Cubs pitchers surrendered three home runs and the Diamondbacks turned four double plays to complete the sweep with a 5-1 victory. Satchel Paige's K.C. 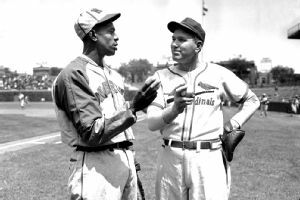 Monarchs defeated Dizzy Dean's All-Stars in front of 29,000 fans at Wrigley. 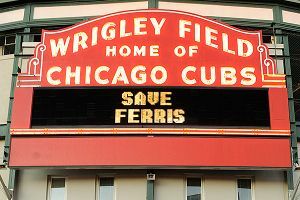 The Cubs celebrated the 25th anniversary of the release of the movie "Ferris Bueller's Day Off," about a suburban kid who plays hooky with his best friend and girlfriend and asks Chicago movie fans to suspend all notion of disbelief. He eats lunch at a swanky restaurant downtown, visits the Sears Tower, Art Institute and Chicago Mercantile Exchange, performs in the Von Steuben Parade and goes to a Cubs game (and catches a foul ball) all in the same afternoon. 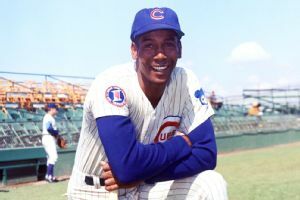 Ferguson Jenkins showed he still had something left in the tank in his final season, pitching a four-hit, complete-game shutout against the St. Louis Cardinals for his 281st career win. Jenkins was released the following spring, finishing his career with 284 victories. The Cubs celebrated their first postseason berth since 1945 by taking a victory lap around the park after a 2-1 win over the Cardinals on the last day of the regular season. 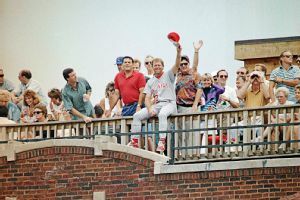 Reds pitcher Tom Browning pulled a prank, appearing in uniform on a Wrigley rooftop during and waving to his teammates. He reportedly pulled the stunt to loosen up his slumping team after the firing of manager Tony Perez. New manager Davey Johnson wasn't amused and fined Browning. 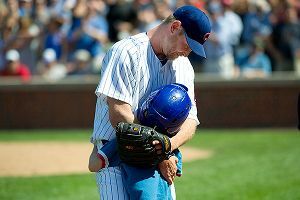 Kerry Wood wanted to end his Cubs career on a high note, and the fan favorite did, striking out the last batter he faced before greeting his son as he walked off the field to the dugout for the final time. The Cubs and Cincinnati Reds tied the NL record for most combined homers in a single game: 11. The Cubs beat the Reds 16-15 in 13 innings. The St. Louis Cardinals' Stan Musial collects hit No. 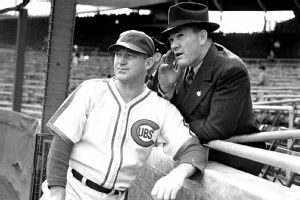 3,000, a pinch-hit double off the Cubs' Moe Drabowsky. Bill Madlock won the National League batting title by going 4-for-4 on the last day of the season, edging out Ken Griffey Sr.
Grover Cleveland Alexander pitched a 58-minute, nine-inning game, a 3-0 win over the Boston Braves. 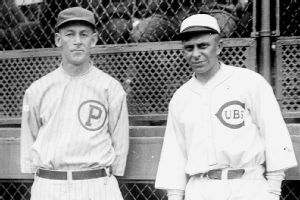 The Cubs' Jim "Hippo" Vaughn and the Reds' Fred Toney had no-hitters through nine innings before Cincinnati's Jim Thorpe, a former Olympian, drove in the winning run in the 10th. Toney finished the no-hitter. 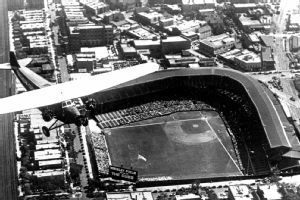 The stadium took on its current Wrigley Field name at the start of the 1927 season. 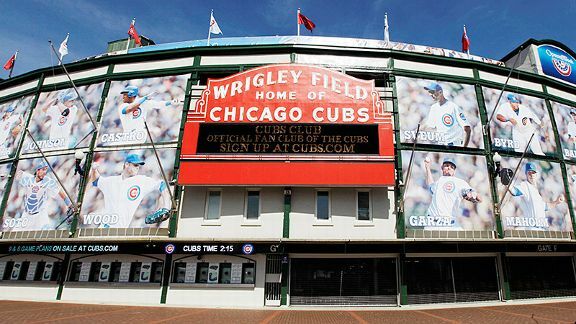 The Cubs beat the St. Louis Cardinals 10-1 before 42,000 in the first game in the newly renamed ballpark. The Cubs began an epic rally in the bottom of the sixth, eventually coming back from a 9-0 deficit to beat the Houston Astros 10-9 in 10 innings. Dwight Smith drove in the game winner with a bases-loaded single off Dave Smith. 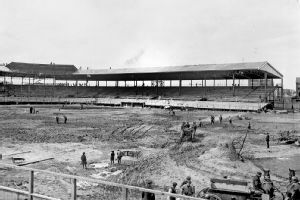 Before they were the Bears, the pro football Chicago Staleys struck a deal to make Cubs Park their home venue. The franchise played their home games at the ballpark until moving to Soldier Field 1971. 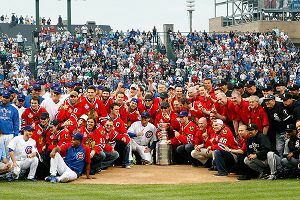 Championship trophies are a rare sight at Wrigley Field, but in one memorable showing of civic pride, the Cubs, White Sox and champion Blackhawks shared the field for a photo op with the Stanley Cup, Chicago's first in 49 years. 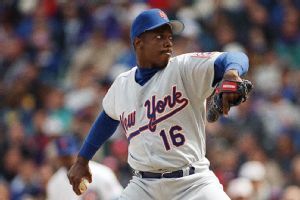 Journeyman outfielder Tuffy Rhodes turned in one of the greatest Opening Day performances of all time, belting three home runs off the Mets' Dwight Gooden. He also singled, but the Cubs lost 12-8. He hit only five more homers that season. With the Cubs playing their first game at Wrigley Field since the 9/11 terrorist attacks, Sammy Sosa sprinted out to his position in right field holding up an American flag, earning a standing ovation. Later in the game Sosa hit a home run -- his 59th of the season -- and held up a small American flag as he rounded the bases. The Phillies rallied back from a four-run deficit, in large part due to four Mike Schmidt homers, as the Phillies beat the Cubs 18-16 in 10 innings. 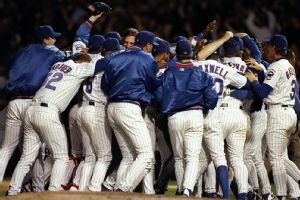 In a game with seven home runs, four triples and six doubles, Sammy Sosa's two-run homer with two outs in the ninth sent the game into extra innings, but the Marlins had the last word as Mike Lowell led off the 11th with a pinch-hit blast to carry Florida to a 9-8 victory over the Cubs in the opening game of the NLCS. 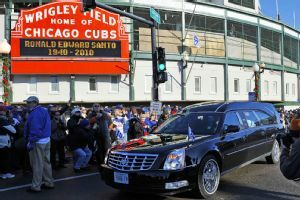 Ron Santo made one final trip to Wrigley Field when his funeral procession stopped at Wrigley Field. Fans lined the streets around the park to pay their respects to Santo, who died from complications with bladder cancer. In the midst of a fierce battle for the NL East lead, the Cubs were getting the best of the Mets in a doubleheader. In the second game, Mets pitcher Ed Lynch hit Keith Moreland with a pitch and Moreland rushed the mound, starting a bench-clearing brawl. Billy Williams played in his 896th consecutive game, breaking the National League record that Stan Musial had held. Williams' streak later reached 1,117 games. 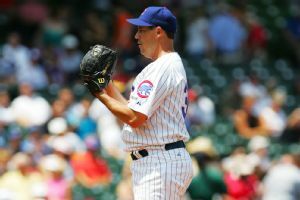 On a day in which rain delayed the start of the game by nearly three hours, the Cubs' Greg Maddux became the 13th member of the 3,000-strikeout club and ninth pitcher in history with both 3,000 strikeouts and 300 victories when he got San Francisco's Omar Vizquel to look at a called third strike to end the third inning. 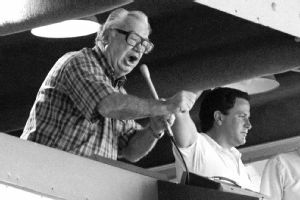 Continuing a tradition he started with the White Sox, Harry Caray broadcast games from time to time from the Wrigley Field bleachers. 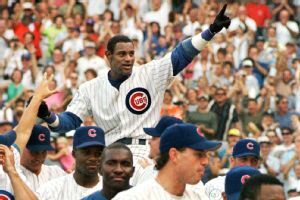 Sammy Sosa sprayed fans in the right field bleachers with champagne while his teammates and manager Dusty Baker jogged around Wrigley Field in celebration of the Cubs' 4-2, 7-2 doubleheader sweep of the Pirates that clinched the NL Central. It was the Cubs' first division championship since they won the NL East in 1989. The Cubs clinch the NL Central title with a 5-4 win over St. Louis. The Cubs took their second victory lap around Wrigley in two years with their second straight NL Central title, the first back-to-back postseason appearances since they played in three consecutive World Series from 1906 to '08. 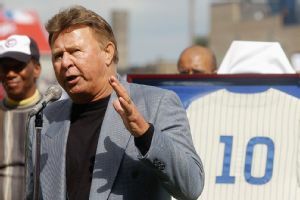 Claiming it meant more to him than the Hall of Fame, which eluded him during his lifetime, Ron Santo became the third Cubs player after Ernie Banks and Billy Williams to have his number retired. The nine-time NL All-Star was recognized one day after the Cubs won the NL Central and within two years of losing both legs to diabetes. 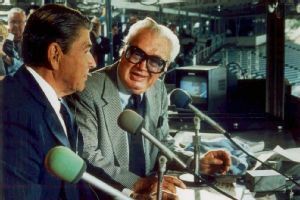 As his presidency wound down, former baseball broadcaster Ronald Reagan stopped by the Wrigley Field press box to do a little play-by-play with Harry Caray. The Cubs retired Ernie Banks' No. 14. 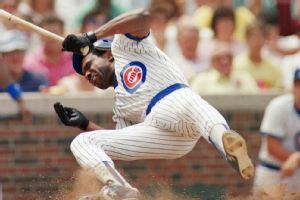 Banks is the Cubs' all-time leader in games played (2,528), at-bats (9,421), and total bases (4,706). 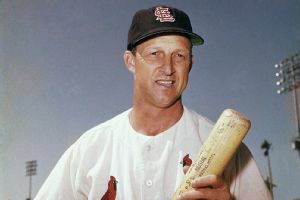 He won back-to-back NL MVP awards in 1958 and 1959. 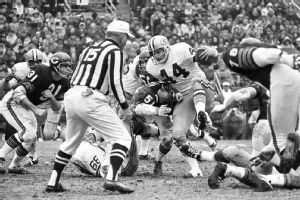 The Bears played their final game at Wrigley before moving to Soldier Field, beating the Green Bay Packers 35-17. 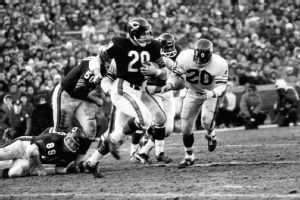 In the first year the NFL was split into two divisions, East and West, the Chicago Bears won the inaugural NFL championship game over the New York Giants 23-21 in front of 26,000 spectators. 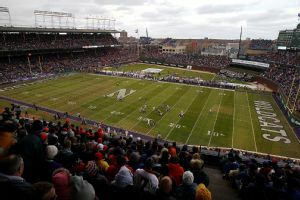 Illinois took on Northwestern in the first college football game at Wrigley since 1938 -- and the first football game of any kind since the Bears left for Soldier Field after the 1970 season. Because the east end zone was one day earlier ruled unsafe with just a foot clearance until the brick wall, only the west end zone was used. Mikel Leshoure ran for a school-record 330 yards and two touchdowns as the Illini beat Northwestern 48-27. With both teams finishing the regular season with 89-73 records, the Cubs and Giants played a one-game tiebreaker to determine the NL wild-card team. Gary Gaetti homered and Steve Trachsel pitched 6 1/3 scoreless innings. Leading 5-0 going into the ninth, the Cubs held on for a 5-3 victory and a matchup in the NLDS against the Atlanta Braves, who swept them out of the playoffs. 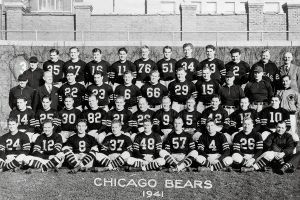 The Bears defeated the New York Giants 37-9 to win the NFL championship. The Cubs beat the Tigers 8-7 in 12 innings to force Game 7 in their last World Series appearance. Forty-nine runs were scored at Wrigley Field in what is still the highest-scoring game in major league history. 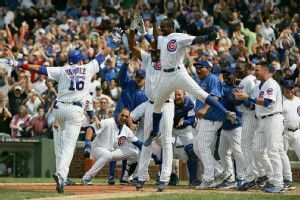 The Cubs beat the Philadelphia Phillies 26-23. The Cubs had a 25-6 lead in the fourth, but the Phillies outscored the Cubs 17-1 during the last five innings. The Cubs escaped a threat in the ninth to avoid what would have been the biggest comeback in history. 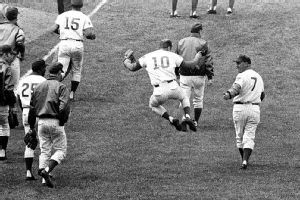 Excited after a ninth-inning comeback win over the Expos, Ron Santo performed his first heel-click, running up the third-base line and clicking his heels three times. Santo, who battled diabetes during his playing career, was elected to the Hall of Fame in 2012, two years after his death. The Cubs clinched the National League pennant with a 5-2 win over the Pirates. 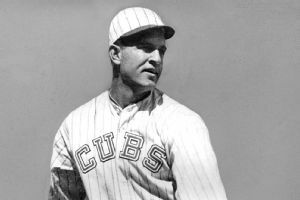 Burt Hooton, a 22-year-old rookie, tossed a no-hitter against the Philadelphia Phillies on a chilly day at Wrigley Field. 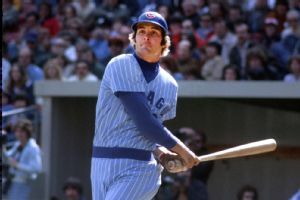 Dave Kingman, then with the New York Mets, hit the longest homer at Wrigley, traveling 500-plus feet up over Waveland and down Kenmore. 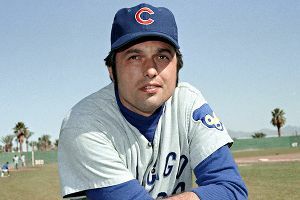 Kingman would join the Cubs in 1978. 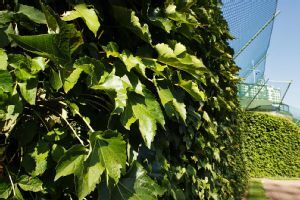 One of Wrigley Field's signature features -- the ivy along the outfield wall -- was planted in 1937 under the direction of general manager Bill Veeck as part of a plan to improve the bleachers. 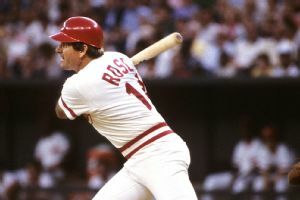 Pete Rose hit two singles off the Cubs to tie Ty Cobb's record of 4,191 hits. 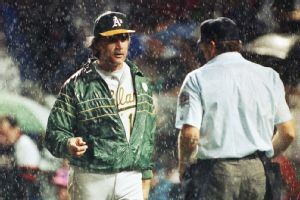 The game was suspended due to darkness after the ninth inning, resulting in a 5-5 tie. 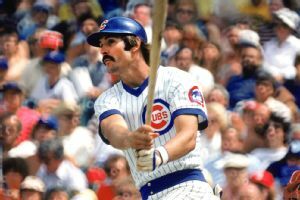 The Cubs lost 23-22 to the Philadelphia Phillies in 10 innings, despite three home runs from Dave Kingman. 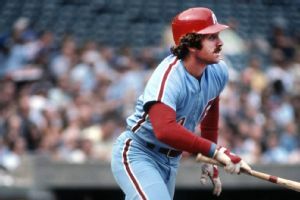 Mike Schmidt hit two for the Phillies. There were 50 combined hits in the game. 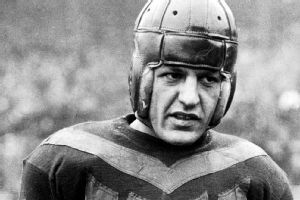 On Thanksgiving Day, Red Grange made his NFL debut in front of 36,600 fans as he and the Bears took on the Chicago Cardinals. Sammy Sosa was fined $87,400 for arriving late to the Cubs final regular season game and then leaving early. Security cameras in the team parking lot caught him leaving 15 minutes after the game started. He was traded to the Orioles later that offseason. 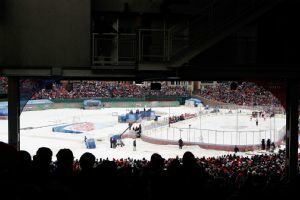 In the first NHL Winter Classic to pit at least one of the Original Six teams, the defending Stanley Cup champion Red Wings defeated the Blackhawks 6-4 before 40,818 at Wrigley. 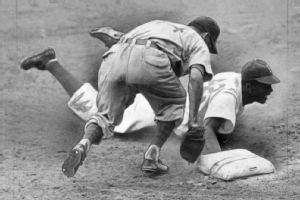 A crowd of 46,572, the biggest in Wrigley Field's regular-season history, turned out to see Jackie Robinson in his first visit to Chicago with the Dodgers. Ernie Banks made his Chicago debut. 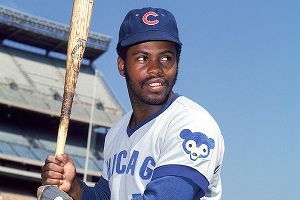 He played 19 seasons for the Cubs and was elected to the Baseball Hall of Fame in 1977. Ken Holtzman threw his first no-hitter, a 3-0 win over the Atlanta Braves in which he outdueled Phil Niekro. 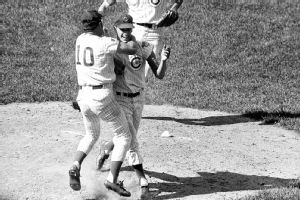 Holtzman did not record a strikeout in the game, which was won on Ron Santo's three-run homer. 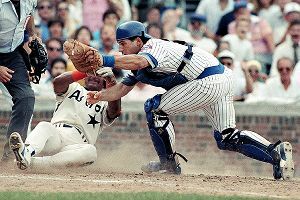 Eric Show hit Andre Dawson in the face with a pitch in the third inning. 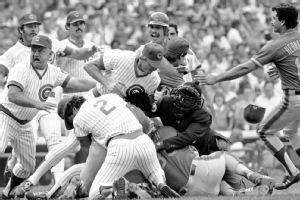 While Dawson remained on the ground, bleeding profusely, Rick Sutcliffe led the charge out of the Cubs' dugout, setting off an ugly brawl. 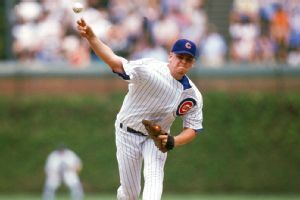 Dawson had hit three homers vs. the Padres in the series, causing the Cubs to believe the pitch was thrown on purpose. 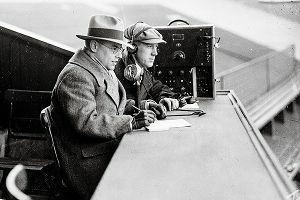 The first Chicago professional game was broadcast from Wrigley on WGN with A.W. Kaney commentating. The Cubs topped the White Sox 10-7. Owner William Wrigley Jr. correctly believed that radio would spur excitement and bring more spectators to the ballpark. 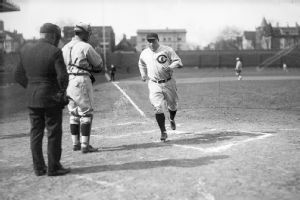 Future Hall of Famer Hack Wilson drove in two runs to set an MLB single-season record of 191 RBIs, a mark which stands to this day. 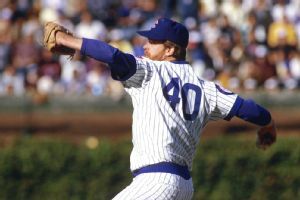 The Cubs hit five home runs, including two from Gary Matthews and one from starter Rick Sutcliffe, in a 13-0 win over the San Diego Padres in Game 1 of the 1984 National League Championship Series. 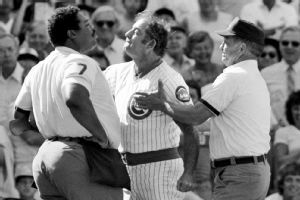 With the Cubs off to a 5-14 start and getting booed by the hometown crowd, manager Lee Elia lost his patience in epic style, going on an expletive-laden rant about the fans' behavior. He apologized and kept his job, but was fired later that season. 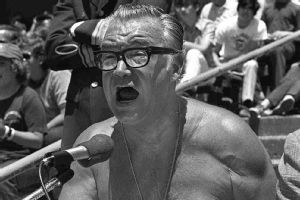 New Cubs broadcaster Harry Caray sang "Take Me Out to the Ball Game" during the seventh-inning stretch for the first time at Wrigley Field in a game against the Mets. 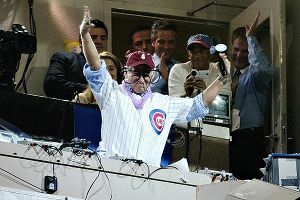 He began the tradition while working in the White Sox's TV booth. 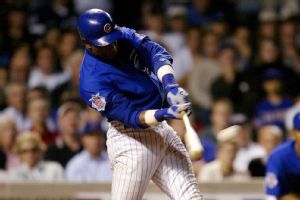 In the middle of one of the worst slumps of his career, Sammy Sosa's bat shatters during an at-bat against the Tampa Bay Devil Rays. The home plate umpire notices something on the infield grass and finds cork. Umpire Tim McClelland ejects calls Sosa out and ejects him from the game for using the corked bat. Sosa later admits his guilt, claiming it was an honest mistake. 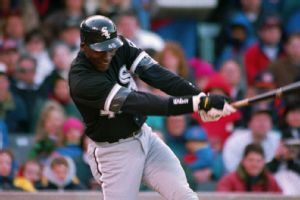 The highlight of Michael Jordan's foray into baseball came in the Windy City Classic at Wrigley Field, when the Bulls superstar went 2-for-5 with two RBIs against the Cubs in the annual exhibition game. The next day Jordan made his minor league debut for the Birmingham Barons. After the Federal League folded, the Cubs moved into Weegham Park. They beat the Cincinnati Reds 7-6 in 11 innings in the first National League game at the park. 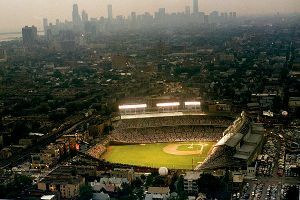 Wrigley Field was named Weegham Park when the first game was played there 100 years ago. 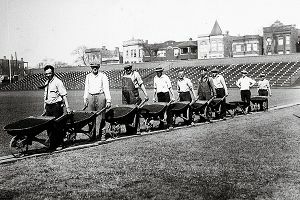 The field hosted Chicago's Federal League team, which was known as both the Federals and the Whales. The Federals beat the Kansas City Packers 9-1 in the ballpark's opener. Trying to recover from losing the "Bartman Game," the Cubs sent Kerry Wood to the mound against the Marlins. 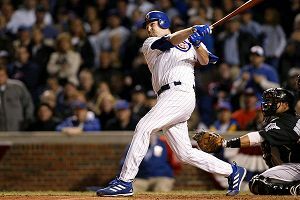 He eased some concerns of Cubs fans when he belted a two-run home run in the second inning to erase a 3-1 Marlins lead. 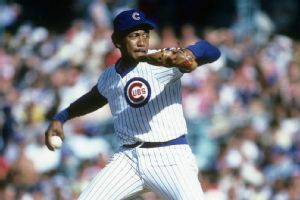 Moises Alou followed with a two-run homer in the third inning for a 5-3 lead but Wood and the Cubs couldn't make it hold up, falling short of their first World Series appearance since 1945. 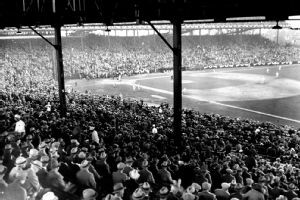 Wrigley Field hasn't seen a World Series game since 1945, but it hosted its first at the end of the 1929 season. The Philadelphia A's beat the Cubs 3-1 in Game 1. Leading 8-0, Milt Pappas loses a perfect game with two outs in the ninth on a walk to Larry Stahl. 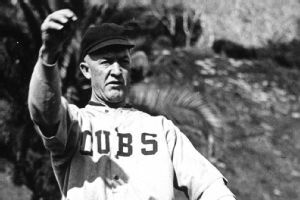 Pappas held on for a no-hitter, but he claimed home-plate umpire Bruce Froemming cost him the perfect game because of a bad call. Billy Goat Tavern owner William Sianis reportedly placed a curse on the Cubs after his pet goat was denied entry to the 1945 World Series vs. the Tigers. 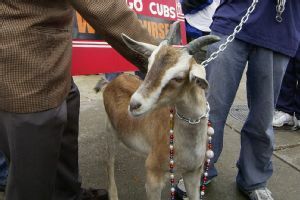 The Cubs have not returned to the World Series since, despite the efforts of Sianis' nephew Sam, who has been allowed by the club to bring a goat onto the field several times, the first time in 1984. 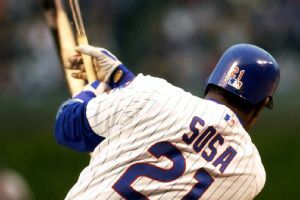 Sammy Sosa hit two home runs -- Nos. 61 and 62 -- to tie Mark McGwire during the great home run race in 1998. Sosa's two 480-foot blasts came in an 11-10 victory over the Milwaukee Brewers in 10 innings. He finished the season with 66, behind McGwire's 70. The Bears' defense, known as the Monsters of the Midway, stopped the Giants and Y.A. Tittle to win the NFL championship game 14-10. 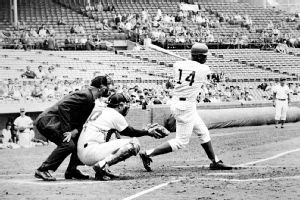 Ernie Banks hit his 500th home run off Braves pitcher Pat Jarvis. 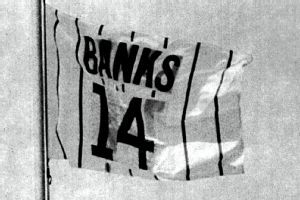 Banks retired the next season with a career total of 512. 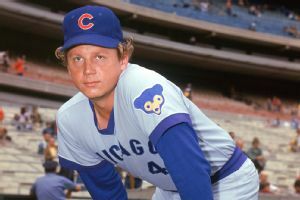 The long-awaited first night game at Wrigley Field, the only ballpark in the major leagues without lights, went bad from the start when Phillies leadoff hitter Phil Bradley homered off Rick Sutcliffe before the game was rained out after three and a half innings. The first official night game came the next day with a 6-4 victory over the New York Mets. 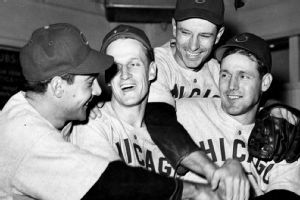 Gabby Hartnett's two-out, game-winning shot at twilight -- known as the "Homer in the Gloamin'" -- put the Cubs in first place. They won the division three days later. 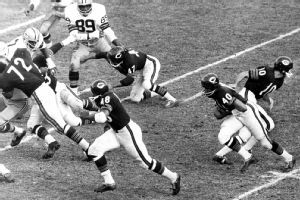 Gale Sayers tied an NFL record with six touchdowns in a single game as the Bears beat San Francisco 61-20. 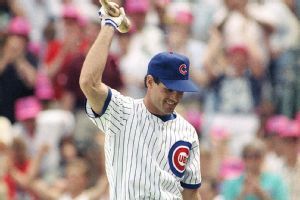 In what would quickly come to be known as the "Sandberg game," Ryne Sandberg saved the game twice with ninth- and 10th-inning home runs off the Cardinals' Bruce Sutter. The Cubs went on to win 12-11 in 11 innings. In just his fifth major league start, 20-year-old Kerry Wood turned in one of the most dominating pitching performances of all time, striking out 20 Astros while allowing no walks and just one hit. 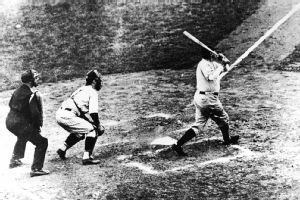 A legendary tale was born in Game 3 of the World Series with Babe Ruth's called shot. 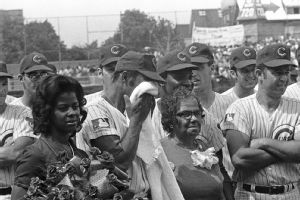 Witnesses said Ruth pointed to center field before launching his home run, although Cubs pitcher Charlie Root maintained until his death that no "called shot" occurred. 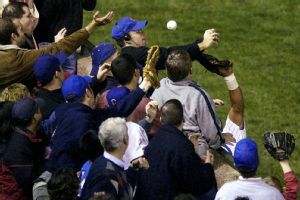 The image of the bespeckled fan wearing a Cubs hat, blue sweatshirt and green turtleneck was forever etched in team history when Steve Bartman, along with several other spectators, reached for a foul ball by the Marlins' Luis Castillo with one out in the eighth inning and the Cubs leading 3-0 in Game 6 of the NLCS. 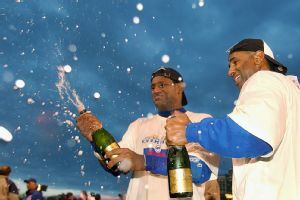 Bartman deflected it from Cubs left fielder Moises Alou and the Cubs ended up yielding eight runs in the inning, losing 8-3 and being eliminated in Game 7 the next day.